Painting has just become a metaphor for the bigger picture, but it’s not just a metaphor: it’s a practice, a meditation, and a dedication that takes me into a space of contemplation. Nomos Journal’s chief editor Seth M. Walker recently met with the prolific visionary artist Amanda Sage on a veranda in her hometown of Boulder, Colorado, to discuss her place within the contemporary Visionary Art movement and some of its more recent organizational manifestations. Amanda Sage started off her career as an artist with a very simple goal and ambition: to simply create. “I didn’t really know what I wanted to draw or paint,” she states, but looking back, she realizes that much of it had to do with “a very healthy, very experimental, and open childhood.”1 Amanda was born in Denver, Colorado, and after having relocated to Deerfield Beach, Florida, at an early age, she found herself back in Colorado during her adolescence and high school years. She attended the Shining Mountain Waldorf School in Boulder, Colorado – a school dedicated to the educational philosophy of Austrian philosopher Rudolf Steiner. The unique program seeks to “educate individuals to realize capacities of lively independent thinking, artistically-cultivated feeling, and moral courage for responsible action,” while striving “to develop this full measure of human potential that allows for the recognition of one’s lifework and service to humanity.” The education she received in Boulder, Colorado, coupled with her influential upbringing, instilled in her the values, ideals, and aspirations that helped shape who she has become today. I didn’t really start painting until high school. Up until that point, I did a lot of drawing, and my first introduction to being able to draw “semi-realism” was at the Waldorf School. My high school art teacher, Hikaru Hirata-Miyakawa, first introduced me to acrylic painting. Although I didn’t know it at the time, he was part of the Visionary Art movement. He also first exposed me to the work of my future mentor: Ernst Fuchs. Her parents were also incredibly influential in both her personal development and career as an artist. “My parents were very open and different in their own ways,” Sage states, who describes her mother as an “adventurer of consciousness” and her father as “a dedicated guardian with a childlike spirit and universal heart.” They provided her with much freedom, conversation, and opportunity while she was growing up – especially by putting her through the Waldorf School. Her mother’s full and legal name is “You,” demonstrating the message instilled in Amanda from an early age that everything and everyone is interconnected. Amanda emphasizes how proud of them she is, and hopes that their fearlessness and principles will come out more and more in herself as she progresses further down her own path. While she was living in Florida during her pre-adolescence, Amanda became involved with the Unity Church, which embraces a metaphysical interpretation of the Christian Bible. This commitment continued when she relocated to Boulder, and she became deeply involved in Church-organized youth groups and trips. “We went on Native American-influenced vision quests,” she states, “and traveled to large, meditative get-togethers with other youth groups around the country.” Unlike most of her high school peers, Amanda spent the early hours before school in the meditation hall at the Unity of Boulder Spiritual Center engaging in silent meditation. Her experiences throughout this time proved to be foundational for her future development. I don’t think I started to see how the spiritual aspects of my youth and high school years were influencing my art and expression until somewhat recently, actually, because it was so naturally a part of me. Now I want to go back and say, “guys, I’m ready to do a talk here,” because I’ve figured out that what I’m doing is actually totally interconnected with their teachings. The overall message from Waldorf, the Unity Church, and her parents, was that of interconnection, and that message has guided her throughout her life and career ever since. Following high school, Amanda continued her development as an artist by working with two incredible, and influential, visionary art pioneers: Michael Fuchs and his father, Ernst Fuchs. After high school, I went on a journey to Vienna, Austria, to study classical painting with Michael Fuchs as an apprentice. From Michael, I learned the classical Mischtechnik of the old masters.3 When my two-year apprenticeship with him was finished, he successfully advised his father to take me on as an assistant. Ernst Fuchs is definitely a godfather, I’d say, of the Visionary Art movement, and it was an honor to work with him on a variety of projects for about ten years. Although Amanda describes it as having been “a blessing to work with Ernst Fuchs,” it also proved to be very difficult, at times. She assisted him for five summers on a life project of his in Klagenfurt, Austria: “The Apocalypse Chapel.” The entire project took about thirty years for him to complete, and she had been tasked with painting all of the “fantastic draperies” on the ceiling. “At times, it drove me crazy – living with the priests and being confined to the ‘spooky’ church with no ventilation. It was intense.” But, looking back, she is extremely grateful for the experience and the stories she now has. While I was in Vienna, I wasn’t involved in or exposed to the contemporary Visionary Art movement. I didn’t really have any peers or know anyone my age involved in the movement during the late ‘90s and early 2000s. I didn’t know many visual artists, and even though I was from America, I knew very few artists there. But, I started to find people through the Internet, and when other artists sought out [Ernst] Fuchs while I was working with him, it was a great opportunity to meet artists from all over the world. Phil Rubinov-Jacobson, who was a student of Fuchs during the ‘70s, was also very influential in connecting me with others; he invited me to teach the “underpainting” section of his summer seminar “Old Master, New Visions” in 1999 and 2000 in Payerbach, Austria. It was during these seminars that I began painting again from my imagination. 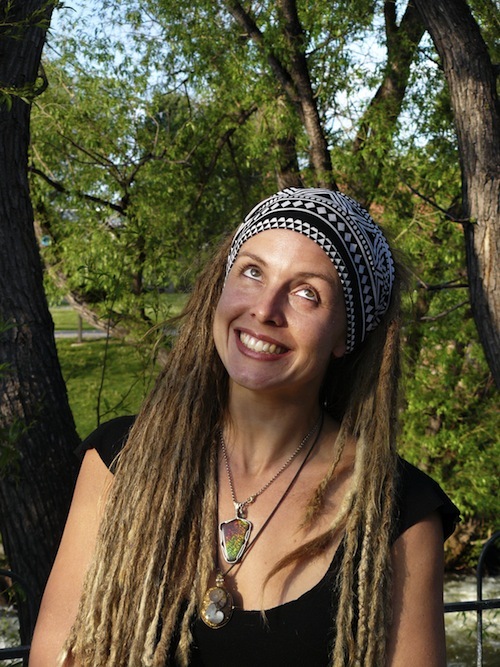 As she met and connected with visual artists driven by the same sentiments and aspirations at festivals such as Burning Man, in groups such as Tribe 13, and through the Internet on various networking websites, Amanda further embraced and developed a technique of her own, which had been instilled by her former mentors and teachers in Vienna. All he [Michael Fuchs] was interested in was teaching me how to see. Not just see, but being able to translate what I see. Drawing something from nature, he emphasized, was as close to divine representation as one could get. The basis of what’s important is not being able to render something realistically; it’s what that will teach you to be able to express later. Studying light and form, and how they adhere to the laws of distance and transparency, and all of these really basic techniques, are kind of what I feel like I’m going to become more of a proponent of. As I’ve talked and given advice to more people, I’ve realized that it reduces down to: how dedicated are you to your drawing and being able to represent what you see, how is your exercise actually studying nature, and how much are you actually in communion with nature? There is a certain kind of romanticism in trying to paint dream worlds and other worlds, and there is a fun kind of release and escape from this physical world in doing so. But, if you dare go down the path of studying nature and loving it so much to be able to represent it in its truest form, then you can really become magnificent. Amanda’s mission to further see came to a climax during a solo two-month “vision quest” she decided to take in 2006 to Bali. With only a roll of canvas, some paint, and brushes, she sought to look more deeply into herself, as not just an artist on the forefront of an expanding movement, but as a visionary on a path to help transform the world around her. During this trip, she found what has become quite a common motif in many of her paintings: the egg. I went looking, initially, for a form in which I could feel completely safe and free. I started a really intuitive piece, and it ended up becoming a painting of myself asleep with the rice fields and palm trees behind me. A rainbow serpent-snake appeared in the sky with an egg in its mouth, and that’s when it appeared. And it does that with painting. It’s very trippy when you let go. You look into the formula, you look into “the mess,” and you see some exquisite creature come out of it. Then, you skillfully refine it and show everybody else. I think that having the skill to refine what you see in “the mess” is one of those secret little tools. The egg symbolizes more of an ultimate window into the infinite. It is a container from which we all come. It is a divine form, and the most reduced organic form. It is both a portal and a doorway. Amanda’s official statement as an artist expresses her desire to shatter the “illusion of separation” and “challenge the viewer to question, and evolve out of ignorance, conditioning and ingrained genetic habits.” Through this, she seeks “to create portals that open to the infinite possibilities of being and expressing, so that we may remember and re-discover who we are, where we originate from and where we are headed.” The egg motif is certainly a unique extension of her aim to create these types of artistic manifestations, but the source for the visionary experiences that inspire such creations is equally unique. It varies for me, and is very experiential, in that I’m creating it as it’s happening. I don’t premeditate it. Very rarely have I seen a work finished before I’ve created it. A lot of it often develops out of an emotion, an idea, something that I’ve gone over in my head enough times that it won’t go away, and I use that as a route to then see where it goes. I’ll start with a general color palette, or I’ll have the shape of the egg with a face in the middle, and then see what happens off of that. I’ll start with very basic things that allow a story to come through on its own, and then I nurture it, and try to guide it and follow the storyline that is of course influenced by my interpretation, but is very much inspired by the freedom of what is happening. In live paintings, I’ll sometimes hear somebody talking to someone over “there,” and I hear them say something that refers to this over “here,” and it will inspire the direction of my painting. Series will develop out of a natural recognition of how things tie together. Music, especially live music, has so much energy that helps fuel painting. I feel like I am a part of the band. Amanda’s creative process is very spontaneous, and according to her, it feels like it is becoming ever more spontaneous as the years pass. Even in the studio setting, she seeks out a number of different ways (music, radio shows, audiobooks, etc.) to distract herself from what she is doing – lest she “think too much” about it and refrain from “letting go,” which are both key components in her creative process. “Some of the best work comes through when I’m not really paying attention,” she states. “The more you try to control it, the more your brush is going to wobble.” Oftentimes, she feels that she needs to disconnect her body and mind from each other; the purposeful distractions in her studio distract her mind so that her body can go on “automatic.” It lets her body “do its spontaneous thing,” closely mimicking a live performance. It’s torturous, actually, for me to paint sometimes. It hurts my body. I have to make up all kinds of excuses to get myself to do it. It’s much easier for me to paint in a live setting, and I get a lot more done, at times, because I’m put on the spot. But, in the studio it’s like a dance that I do…a really silly dance around my painting. I feel like every time I paint the stakes are higher as I realize what is unfolding. The one thing I can fall back on is the observance of patterns, and those fascinate me more than anything, and reveal themselves through the act of painting. I discover things and am prompted to think certain thoughts and connect lines. All of my paintings are an exploration of an ever-evolving mission. Underlying all of this, however, is the inevitable question of definition: what is “visionary art,” and, moreover, what does it mean to be a “visionary artist”? 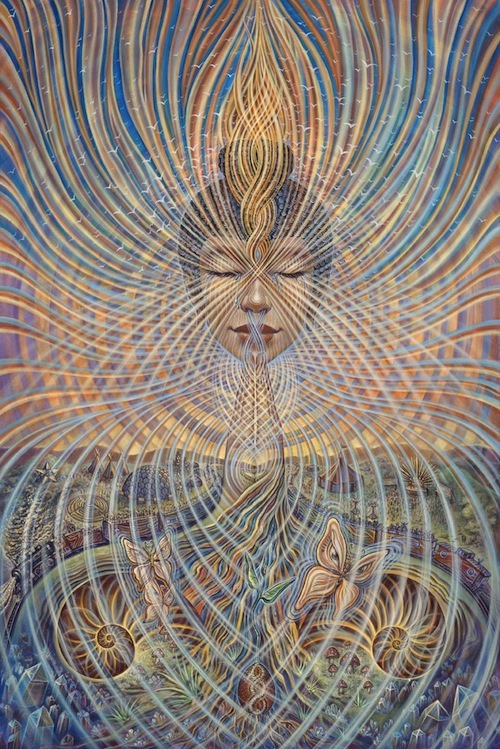 According to Amanda, the definition of “visionary art” seems to change every time she tries to think and write about it, because she cannot get it “universal enough.” Several of her contemporaries have tried to expound and explicate the scope of their work – two of the most notable, perhaps, are Alex Grey and Laurence Caruana – but the variation remains, and the definition continues to be rather elusive.4 Although Amanda accepts and respects the opinions and positions of artists such as Grey and Caruana when it comes to definition, as she feels they “bring an interesting perspective to the table,” she considers the possibility that her own understanding is even broader and more universal than most. First of all, I always say that it’s not just “visionary art”: it’s “visionary art and culture.” It is something that is fueled by a powerful and all-knowing source. Maybe some people can define that source, but it’s something that is fueled by a passion. I don’t want to necessarily say, “channeled.” It’s an inspiration, a vision into the future, something that has in mind a universal story, and that is very difficult from the subjective viewpoint, because we always tie in our connections and how we see things. Humans have been interpreting their experience through art as far back as we have records. My aim and hope for visionary art would be that as a definition, or as a movement, it continues to embrace and open its arms to as many different expressions of art as possible, including the different mediums of expression and creativity. I feel like visionary art has the potential of becoming something that millions of people could identify with. Sacred and symbolic art – the illustration of what spirit is, what God is – all of these things are incredibly connected to our journey of exploring what life is, why we are here, and this connects the entire planet. So, we’re in a time in history right now where we have this incredible opportunity to unite through our unique differences and common needs – we have to before we are slated by our own mistakes – and I think that visionary art can be at the frontier of this movement of reclaiming the earth and helping the majority of the planet realize that we have the power to turn this around. It’s not going to be easy, and the more I go around and I see how many cars and all the dependencies and luxuries that we have – some of us, and some of us not – I wonder how we are going to balance this thing out. I don’t know. But, I totally think that art has the power to help fuel this awareness. Art is a powerful, symbolic language that can deeply communicate this type of message. It is a vehicle of transformation and inspires movement. My visionary art is fueled by seeing the potential and creating a modern legend. That legend is something that is supportive of consciousness, where people care for the earth, they care for each other, and the balance of this existence and how we can do it differently. Painting has just become a metaphor for the bigger picture, but it’s not just a metaphor: it’s a practice, a meditation, and a dedication that takes me into a space of contemplation. In a way, she states, “the train,” can be understood as the natural evolution of Burning Man, the Rainbow Gatherings, the Occupy movement, or the World Fair, in that it brings the underlying sentiments of these cultural phenomena out into the rest of the world. It represents – and perhaps literally actualizes – efforts to unite groups all over the world working towards a better earth, leaving behind “rejuvenation, regeneration, and new community centers in its wake” – and, more importantly, people who are inspired. Nodes are another important aspect of all of this, because there are different communities and intentional communities popping up all over the place where people are gathering and saying, “let’s grow our own food, let’s collaborate to produce new energy sources, and let’s do things a little bit differently. Let’s do it all together.” So, “the train” is a nomadic constellation that connects these things. It’s like the messenger, and has the potential to bring a greater population of the planet together and invites them in with open arms. During an event for Ernst Fuchs’ 80th birthday (2010) in Vienna, I was asked to be one of three speakers because of my connection to the new and old worlds. I was the last to speak, and specifically spoke towards the future. This is when I was already connected in the U.S. and doing a lot of work with the North American and worldwide Visionary Art movement. Fuchs basically passed, in a sense, the key on to me that was passed on to him, metaphorically, by [Salvador] Dalí. He got up in the middle of my speech and said, “She is carrying the torch into the new world.” He chose me for that moment, and I take that quite seriously. I feel like the bridging of worlds is crucial, and I feel honored to be able to be in this position. 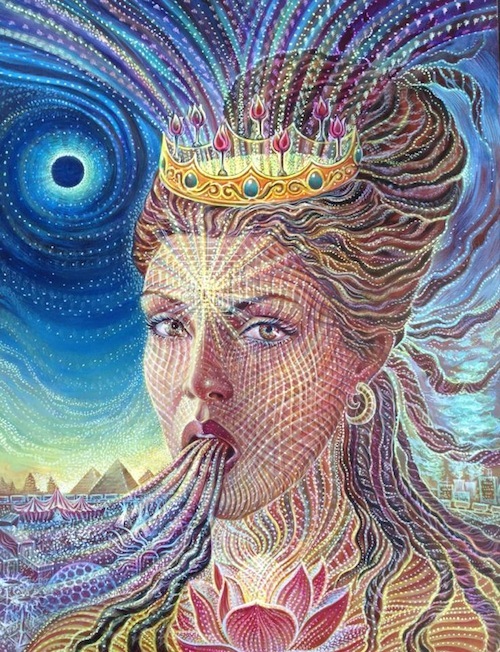 One particular result of this bridge, and the connections Amanda has made with the various friends, assistants, and artists associated with her and Ernst Fuchs over the past few years, is the recently founded Vienna Academy of Visionary Art. “It was always a dream of his [Fuchs],” she states, and the joy she feels in knowing that he will be able to witness it take shape brings her to the verge of tears. “The first years are going to be incredible,” Amanda adds, “because Fuchs and some of the masters in their last years will be close by.” The Academy opens this September in the center of Vienna – adjacent to the Phantasten Museum (housing some of Amanda’s own work), Ernst Fuchs’ studio, and the Palais Pálffy. Amanda, along with nine other former students of Fuchs, is included in the Academy’s Visionary Guild. The Academy grew out of an expansion of the “Visions in the Mischtechnik Seminar” annually held in an “eco-village” in Torri Superiore, Italy, for the past six years. Each year, the seminar gains more recognition with full attendance, which has led to the development of something more expansive and momentous. The Academy’s current director, Laurence Caruana, notes that following the fifth seminar Amanda suggested the timing would be perfect to open an academy. Caruana, another former student of Fuchs Amanda had met while working with Rubinov-Jacobson in Austria, emphasizes how instrumental she has been in not just the founding of the Academy, but the personal connections that have facilitated its actualization: “Amanda Sage opened the door, and I walked through.”6 Amanda is going to be holding a two-week seminar in the spring titled “Free Your Expression,” which will engage various aspects of live painting and collaboration, along with the exhibition process and the professional components of selling one’s work. Comparing the founding of the Academy in Vienna to a fresh seedling being conditioned by the nutrients and mineral content of the soil in which it is planted, Amanda notes the rich and creative background in Vienna, along with the Academy’s connection to those roots. Vienna is a place that has nurtured many artists – in music, in art, in many different things. So, historically, it has a context that is very powerful, and it has a more contemporary context, by association, to the Fantastic Realists who were there in the ‘50s and ‘60s. 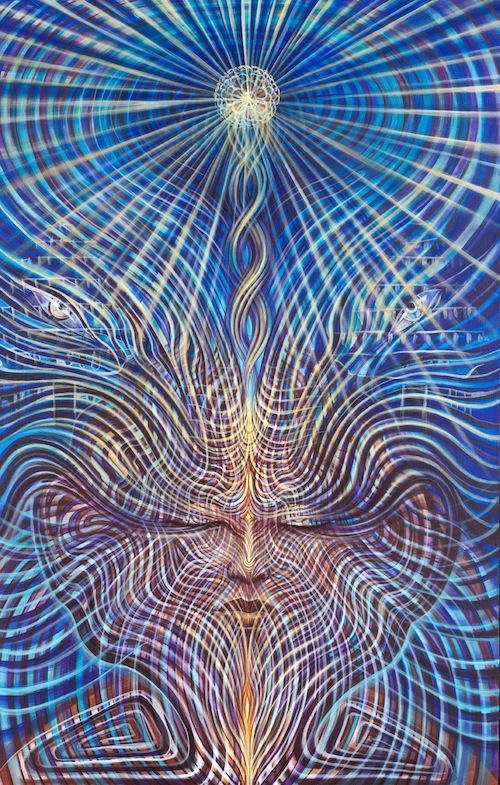 It has a very unique background, and from those artists stems a lot of influence for the contemporary Visionary Art movement. So, it’s an interesting connection of roots that brings the Academy to Vienna. The location has a lot of potential, and there’s something special about it. But, at the same time, it has these deep philosophical roots that have produced so many intense luminaries from our past who were deeply influenced by Vienna. I love the idea of the Academy, because it offers people a window and an opportunity into a time and place on a very fertile soil for self-education, for immersion, and introduction into a scene and place that is otherwise not so accessible. And, because of having the relationships that we [the Guild] do with Fuchs and with many of the other artists, this is possible. Nobody could do that without these extensive relationships, and this is what will build over time, and it will continue to evolve. At the heart of the Academy’s mission is “the individual artist’s quest for beauty, harmony and unity, through interpretations and visions of the Sacred. With a solid technical foundation, the next generation may revive a higher form of art – an Ars Sacrum that idealizes the human form, while actually transfiguring humanity through visions of oneness and evolutionary concepts.” The Academy’s motto, then, “Ad Sacrum” (“Toward the Sacred”), is certainly fitting. I feel like more and more of my work fits into that definition, “towards the sacred.” I like the idea of it being a symbol, a meditation piece, something that people return to – save on their screensaver, have a little card somewhere, or put on their altar – that it be something that inspires their spirit and something that they want to continue to go back to. So, it’s kind of like a contemporary prayer tool, and I feel like that naturally happened. I’ve always very much admired sacred art and I would like to see more work translated into themes and symbols that communicate to a multi-generational and multi-cultural audience. Amanda is also involved with another recently founded group in her home state of Colorado: the Colorado Alliance of Visionary Artists (CAVA). She describes the Alliance as being a very synchronistic situation, with her fellow Guild member David Heskin also being from Colorado, and the decision he and his wife, Aloria Weaver (also a Guild member), recently made to make their permanent home in Loveland, Colorado. The two of them are incredible artists and event producers, Amanda states, and it is very much a coincidence that they all have some sort of connection to Colorado. There are several talented artists within the Visionary Art movement who have had a continuous presence in Colorado, or are from Colorado. There is a lot of energy here, so why don’t we make something that can be really inclusive? It’s kind of fresh territory. Being a visionary, to me, is proving more and more that you see things before they happen, and I feel like this is something that I’ve sensed for a long time – that this is a powerful place. There’s definitely a surge of energy here, so it seems really appropriate to start this and see what happens from there. Having David and Aloria here, and their cultural arts organization Art Spirit Now, is a strong foundation. I would have never met them if it hadn’t been for their connection to Fuchs’ influence and visionary art, so it all circles back around. The professional aspects of being an artist cannot be ignored, however, “but there is a beautiful synergy that also happens when one releases the fear of survival,” Amanda states, “and it is important to keep an open mind and be creative in all aspects of life. Being an artist helps to see that creativity is one of the greatest assets we have as humans.” Yet, throughout her career as an artist, Amanda has noticed that the most challenging part is the personal relationship – of believing in herself. It’s strange how people think that perhaps it becomes easier with success, but the deeper you go, the more you get all of it. It’s all a grand dance and it never ends. Learning to dance with life rather than aimlessly bumping into things is incredibly rewarding, and the more one practices it, the better one gets. And, truly, it is all about practice and dedication, motivation, and passion. I’ve noticed in the past few years that there is an incredible movement afoot on this planet, like never before, of people hearing each other’s opinions and collaborating in ways never before possible. What I see now, that I didn’t see before, is that this is all actually possible – that the people are ready. How all of this is really going to progress is still developing, but I am patient, as I know the best thing I can do is become ever more impeccable with my actions, words, and live as an example to the best of my ability. I do not feel alone with my visions: I feel there are millions of people dreaming the new world into existence, and I feel honored and giddy as I balance on the edge of my seat, witness, and participate in the unfolding of this great collective dream. Amanda Sage’s journey as an artist and visionary is far from over, and is undoubtedly indebted to her familial and spiritual upbringing, with its emphasis on global interconnection and communion. Reflecting on the development and career of his former protégé, Hirata-Miyakawa admits, “I haven’t even told her this myself, but it’s so wonderful to follow all of her achievements and what she has done. I get her newsletter, and I can’t wait to open it each time and read it, because every one of them is exciting. She is getting famous – more famous than I am,” he adds with a chuckle. “She is a go-getter who is very outgoing and easy to talk to. She has stayed steady in her approach, and continues to befriend many people along the way.”7 This voyage she has taken has helped spawn a vast network and community of visionaries. Her legacy and influence will certainly help sustain this rising generation whose cultural pervasion grows more prevalent with each passing year. 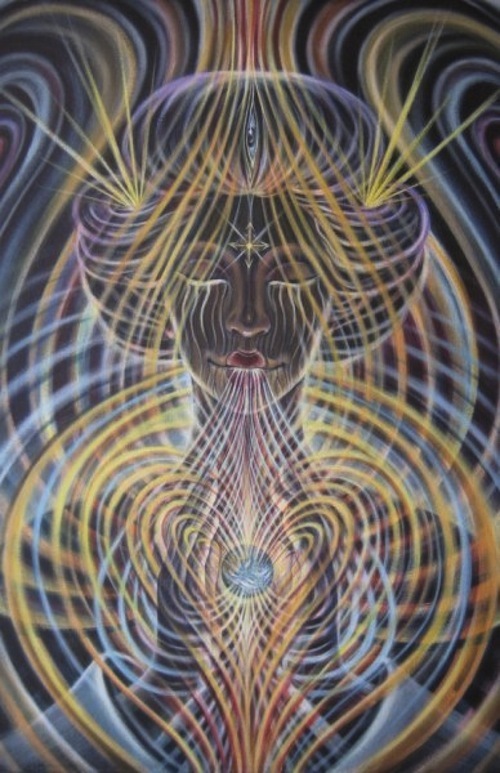 Organizations like Art Spirit Now, the Colorado Alliance of Visionary Artists, and the Vienna Academy of Visionary Art will indeed continue to fuel this burgeoning movement of individuals driven to open the eyes of others in an effort to help them learn how to see their own connection to what is sacred and the world around them. Transforming society through the expression of these visions may sound like an ambitious goal, but it is certainly noble – and certainly not farfetched. Countless societies and cultures before our own have witnessed the unparalleled influence of artistic expression on the world around them, and have been remembered for it throughout history as a result. Amanda’s close friend, colleague, and fellow artist, Alex Grey, succinctly writes: “We remember civilizations for their art.”8 Following this statement, it is perhaps fitting to point out the obvious: we remember such art because of its creators. Aspiring artists and visionaries worldwide will look to the leaders in this new generation of transformative and sacred art, such as Amanda Sage, as they seek to bridge a gap between their own work and that of the old masters before them. She will indeed be remembered as she carries this “torch” into the future, beckoning the appreciation of a form of expression containing the power to unite, build community, and transform society through its unique encounter with what is deemed sacred. All Paintings By Amanda Sage 2006-2013; Original Photographs By Seth M. Walker 2013. As an artist, ambassador, and visionary icon, Amanda Sage brings her own unique mix of painterly wisdom and intuitive insight to the canvas. In 2000, she was awarded a studio at the WUK (Werkstätten- und Kulturhaus), a Viennese cultural center and artists’ collective, where Sage served as administrator and member of the board, organizing open studios and cultural events. In 2007, she began to exhibit with the growing Visionary Art movement in the United States. This led to her relocating to Los Angeles and becoming an influential personality in the transformational festival culture, as well as participating in multiple exhibitions and initiatives worldwide. The art of Amanda Sage is characterized by strong figure-work and portraiture, accompanied by energetic waves of intense color. Each of her paintings is like a portal, opening unto infinite possibilities of seeing and expression. Amanda Sage is at the forefront of a new breed of visionary artists, using art as a tool for personal, spiritual, and planetary transformation. An adept of Live Painting, she now tours the world, delivering lectures, holding workshops in Colorado, Chicago, Los Angeles, Australia, Italy, and Vienna, and painting live while exhibiting her works. She has been instrumental in the founding of the Vienna Academy of Visionary Art, which will open its doors in the fall of 2013. Bravo.. keeping the train moving with spiritual illumination!